Happy New Year’s everyone! I hope you all were able to bring in the new year in style, whether it be watching fireworks, watching the ball drop, or defying the system and going to bed early. This year I decided to host a New Year’s party at my pad and invited all my friends over. Fortunately, Tyson was kind enough to give me the opportunity to serve their delicious Tyson Any’tizers at my little shin-dig, which was perfect since many of my guests were hungry….the kind of hungry that carrot sticks just wouldn’t satisfy. What you see above are Honey BBQ Flavored Boneless Chicken Bites, Honey BBQ Chicken Wings, Homestyle Chicken Fries, Popcorn Chicken, and Chicken Nuggets. (Technically the nuggets aren’t Any’tizers, but they’re still darn good.) Tyson has just launched their new QuesaDipper product line, which looks SOOO good, but apparently the stores out here don’t have them on the shelf yet. BOO! My big concern was how to cook all the of the chicken in my one oven. Fortunately, they all cook at the same temperature, so I just loaded the chicken up onto cookie sheets and kept track of how long the different sheets were in the oven. 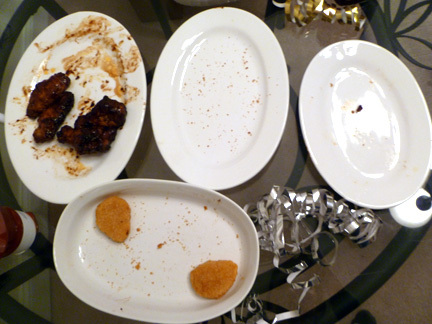 In just 20 minutes, I had a delicious spread of chicken appetizers fit for a king (at least I thought so.) The pic to the left is me showing off the wings and the chicken fries. I plated everything up and set it out for the guests. Here is the “before I said the food was ready to eat” picture. I’ve numbered each type of chicken so you’ll know which is which. I should also mention that about 5 minutes after I took this shot, the rest of the chicken was completely gone. I had zero left overs of Tyson Any’tizers. Everyone raved about how good the chicken was – I think the Honey BBQ ones were the overall favorites of the night. The wings were deliciously messy with a sweet BBQ sauce on them. The chicken bites had the same flavor but with a crispy exterior to them. We ended the night with confetti on the floor, full bellies, and smiles on our faces (we also had a powerhouse prayer session.) Tyson Any’tizers certainly served up a delicious appetizer meal that satisfied everyone’s hunger. 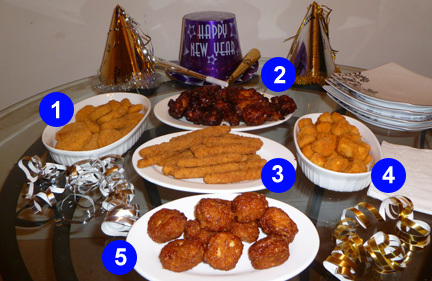 Good food, good friends, good times – what a way to bring in 2011! P.S. Tyson kindly gave me some coupons for Any’tizers as gifts for my party guests and in the spirit of giving, a couple of them were generous enough to donate theirs for a blog giveaway! One winner will receive three coupons for FREE Tyson Any’tizers! Giveaway ends at 11:59 PM EST, January 17, 2010. Disclaimer: This post consists of my (and/or fellow tester) opinions only. Your experiences may be different. No compensation was given for this review/giveaway. I did receive free product and compensation for supplies from the manufacturer or their representing PR agency to use and test for the purposes of this review. This did not affect the outcome of this review. You won’t believe what we did???? My hubby and I decluttered the kitchen and closets! We wanted to start our new year with the beginning of our declutter and organize year! I like Tyson anytizers on facebook! I like you on FB already, I subscribe to your rss feed but I think I might just go subscribe via email so I can read all your giveaways even though I might not get caught up with my google reader! My favorite are the Any’tizers® Chicken Breast Chunks with Spicy Sweet & Sour Sauce. We did a taco bar for New Years at my in-law’s house. I’d like the Honey BBQ Boneless Chicken Bites. We just stayed in for New Year’s Eve after having a BBQ dinner out in a restaurant. We LOVE the Honey BBQ Chicken wings. And you’re right, they are messy. But then that’s half the fun of eating them, right!? Thanks. we ate italian for new years! My family loves the Popcorn Chicken. I love the Breaded Mushrooms the most, and my MIL died on New Year’s so I packed my husband’s suitcase for his trip to Georgia. Sending prayers out to you & your family. My favorite is the Popcorn chicken!! My favorite is their popcorn chicken. We stayed home for new years eve and just watched movies and the ball drop at midnight. Honey BBQ Boneless Chicken Bites are my favorite. Happy New Year! I’m an email subscriber. Thanks for the giveaway. My fave anytizer is the popcorn chicken! perfect quick appetizer! I like the Honey Barbeque Wings. I would like the popcorn chicken. I watched the twilight zone marathon with my son. We made a special early dinner of lobster tails and filets and then later in the evening we had all kinds of appetizers and played games all night. I like the Popcorn Chicken! We went to the aquarium with the neighbor kids and then had pizza at their house. I can’t wait to try their new quesa dippers. I also “Like” Tyson Anytizers on Facebook. Homestyle chicken fries are our favorite! For New Year’s Eve I laid on the couch and watched tv while my husband slept in the recliner. About 12:02 we got up and went to bed. Boring – but relaxing! My favorite is the Homestyle Chicken Fries. I’ve not tried them , but I suspect the Honey BBQ would be my favorite. I like any of them with Honey BarBQue sauce! My new years eve and day was spent going through every room in my house with my husband. We have two rooms of stuff to sell at a yard sale now!!! I like the Honey BBQ Boneless Chicken Bites! Yum! For New Years, we went 5 houses down to my sister in laws, and played bored games til 4 am! I like the Honey BBQ Boneless Chicken Bites. 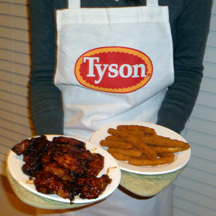 We buy the Tyson Any’tizers Honey BBQ Chicken Wings. We went out to dinner on New Year’s Eve and then spent a quiet evening at home. My favorite Anytizers are the Honey BBQ Chicken Wings. Love the sauce they use! My fave is the Popcorn Chicken variety. Thanks. A family dinner together with my in-laws. Popcorn chicken are our favorites, dipped in honey mustard sauce. Thanks. We like the honey bbq boneless chicken bites. I always make stuffed potatoes to go with it for game day. For New Years we went to the Outback Bowl and watched our Gators beat the Nittany Lions. We were able to get free brunch passes before the game – which meant free shrimp, cupcakes and wine! I am an email subscriber I liked on facebook I love Popcorn chicken and stayed home on New years! We really like the General Tso’s Chicken Chunks. They are wonderful. I usually buy 2 bags of those a week. Yummy! New Year’s Eve was spent with friends & New Year’s Day was spent with family. I love the Any’tizers Cheddar & Bacon Chicken Bites! My favorite is the Any’tizers Homestyle Chicken Fries. 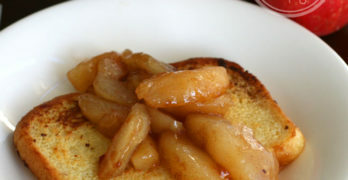 They are so easy for a quick meall or snack. I like the Honey BBQ Chicken Bites the best. we did nothing for new years. Stayed home and watched the ball drop on television. Honey BBQ Flavored Boneless Chicken Bites sound yummy. We went to a party for new years, then came home shortly before midnight and had a champagne toast. I love the chicken fries– they’re delicious! My husband and I went to a really nice restaurant for New year’s eve! 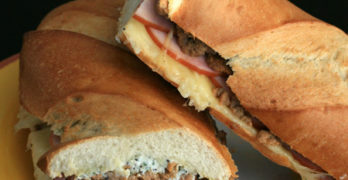 I like the Stuffed Chicken Minis….Cordon Bleu or Pepperoni, they are both great. I like to dip it in ranch dressing. I’m an RSS subscriber – Google Reader. We stayed up late watching movies on New Year’s Eve. My favorite is the Honey BBQ Boneless Chicken Bites. For New year, we attended a New Yeaer’s party hosted by a family friend. I love the Popcorn Chicken Bites. Our favorite is the Homestyle Chicken Fries. I am a fan of Tyson Any’Tizers via Facebook as Jill Myrick. I went to a party at my friends house for New Years. I ended up in his dining room with his sister and a few friends for most of the night. Thanks! We had overnight company so we stayed up late (for kids) and played the Wii. Everyone was out by 11:00 pm. I’m a facebook fan of Tyson Any’tizers Snack Time under username Jennie Tilson. I like the cheese sticks! My favorite is the Honey BBQ Chicken Wings. The popcorn chicken looks yummy. The Honey BBQ Chicken Bites are my favorite. I would like to try the Any’tizers® Cheddar & Bacon Chicken Bites®. We didn’t do anything for New Years. We stayed home and watched the ball drop and then went to bed. Thank you! We stayed up playing cards until the ball dropped. It’s our tradition. We stayed in and made appitizers!!!! Honey BBQ Chicken Wings sound good! I “LIKE” Tyson Any’tizers Snack Time FB page! The Popcorn Chicken is my favorite! I like the hot wings. Homestyle Chicken Fries sound delish! We did nothing for new years eve. We were in bed by 9:30 pm… Must be getting old. I like tyson any’tizers on facebook. My poor husband was called into work on New Years and I spent it alone. I would like the Honey BBQ Bonless Chicken Bites. i love the popcorn chicken. We went to a people/ dog New Years Eve party, there were actually more dogs than people there. Bark, bark..I think we are crazy! My favorite Tyson Any’tizers are the Honey BBQ Chicken Wings! I love the Honey BBQ Chicken Wings. YUMMY! Their Honey BBQ Boneless Chicken Bites are my fave, I love me some barbecue chicken! Our family likes the chicken fries. I love the Tyson Wings! 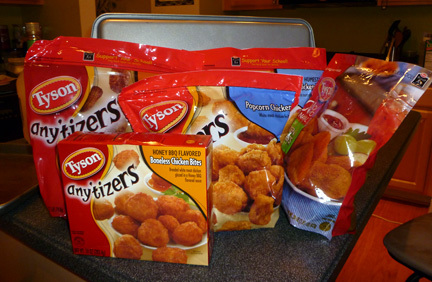 Thanks for the giveaway…would like to try the Tyson Any’tizers / Honey BBQ Boneless Chicken Bites ! We were very boring on New Year’s Eve. We stayed home with just our immediate family and watched the ball drop!! Thanks. I like the Honey BBQ Chicken Wings. My favorite are the boneless chicken bites in Honey BBQ. So far my favorite is the Popcorn Chicken. And for New Year’s eve I was sick so I went to bed early.